Below are descriptions of a selection of my current and past research projects. I have not included unpublished manuscripts, work in progress, or smaller research projects. See my publications for a complete list. My current research is funded by an NSERC Discovery Grant, an NSERC Engage Grant with Cogmation Robotics, two grants from the University Research Grants Program at the University of Manitoba, and a University of Manitoba Start-Up Research Grant. See this page for a list of current graduate students and postdoctoral fellows currently working with me. For additional information on my research projects, visit the the Computational Geometry Laboratory's website. the subgraph corresponding to all network nodes within k hops of itself, for some value of k.
establishing tight bounds on the dilation (the worst-case ratio of actual route length to shortest path length) for k-local routing algorithms. Given a list A[1:n] of n items, we consider the problem of constructing a (typically linear-space) data structure that efficiently answers subsequent range frequency queries on A. Each query consists of an input pair of indices (i, j) for which a particular statistic of A[i:j] must be returned (e.g., a mode, minimum, least-frequent element, minority, or majority). partitions with minimum stabbing number. measures of data depth defined in terms of combinatorial geometry. 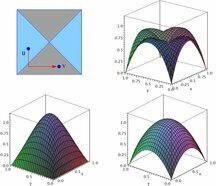 Given a set of piecewise-linear contour lines, define a hierarchical set of one-sided approximations to the contours to efficiently answer queries that determine whether an input piecewise-linear trajectory at a constant depth intersects the terrain. Construct an optimal adaptive range query data structure for box queries on a given set of points in the plane. Given a set of unit discs, a set of points covered by these discs, and an integer k, it is NP-hard to determine whether there exists a subset of at most k discs that covers the points. We consider geometric constraints under which the problem is solvable in polynomial time, and describe efficient algorithms for these cases. See the project web page for additional information. Range scanners capture sample data points from an input polygonal or polyhedral surface such as a room or building. 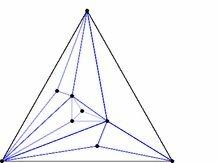 We examine the two-dimensional problem of reconstructing the original polygon as a function of the sample data and their associated geometric constraints. We consider various combinations of geometric constraints, including knowledge of edge orientation, interior/exterior, simplicity, connectivity, orthogonality, and monotonicity. A solution may not exist, may be unique, or multiple solutions may be possible. The problem is solvable in polynomial time under some combinations of geometric constraints while it is NP-hard under others. The traditional problems of facility location are set in a static setting; client positions are fixed and a single location is selected for each facility. Within the last few years, partly motivated by the applicability of mobile computing to the wireless telecommunications industry, these questions have been posed in the mobile setting. Given a set of clients, each of which follows a continuous trajectory over time, the location of a mobile facility is specified as a function of the client positions. The suitability of a mobile facility is determined not only by the quality of its optimization of the objective function but also by the maximum velocity and continuity of its motion. These additional factors often require the optimal location to be approximated, leading to new approximation strategies quite different from previous static approximations. 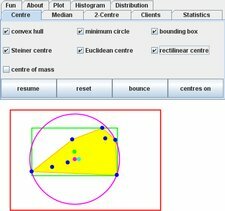 This research presents a variety of challenges including identifying strategies for defining motion for a set of facilities, deriving bounds on the continuity and maximum velocity of the motion and on the quality of approximation for a given strategy, deriving combinatorial bounds on the complexity of the corresponding motion, and developing efficient kinetic algorithms for maintaining the corresponding positions for a set of mobile facilities as a function of client motion. a 1-centre and 2-centres on trees. See this Java applet for a graphical implementation of some of these results. 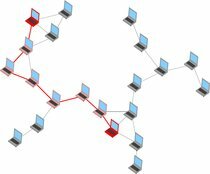 A dense network can be modelled by a continuous region, where each node corresponds to a point in the region. Within this model, a routing policy assigns a continuous path to each origin-destination pair. A natural objective in selecting a routing policy is to minimize the load passing through any single node. While the average load is minimized by straight-line routing, such a routing policy distributes the load non-uniformly, resulting in higher load near the centre of the region. The significance of this problem was highlighted in a recent paper by Karp and Papadimitriou (MOBIHOC 2007). We consider various one-turn rectilinear routing policies in rectangular regions, resulting in a 33% reduction in the maximum load. Our policies are simple to implement, being both local and memoryless. We provide a lower bound that shows that no one-turn rectilinear routing policy can reduce the maximum load by more than 39%. Open questions include identifying policies that reduce the maximum load on more general convex regions. The rectilinear crossing number of the complete graph is a well-known problem in geometric graph theory for which we improved on long-standing upper and lower bounds. The rectilinear crossing number of a graph G is the fewest number of edge crossings attainable over all straight-edge drawings of G in the plane. We describe new drawings of the complete graph that had the fewest number of edge crossings known to date. Since its publication, our work has generated considerable new activity in the area, resulting in dozens of further improvements, some of which employ our techniques to further improve bounds which, until our paper, had remained unchanged for over thirty years.